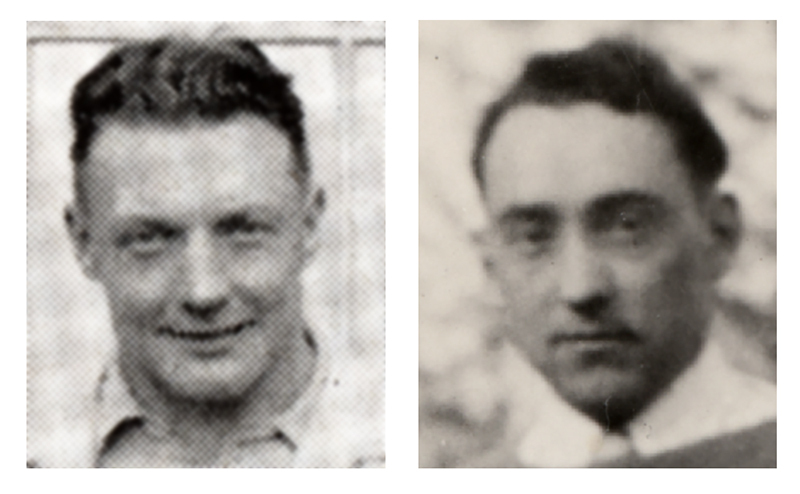 The unknown woman in the original photo (far left above) was replaced with an image of Ed Finholm who worked with his brother, Johnnie (far right). The identity of the man in the center is unknown. Having never painted a mural or worked in this scale, I found Bob Henry on the internet. 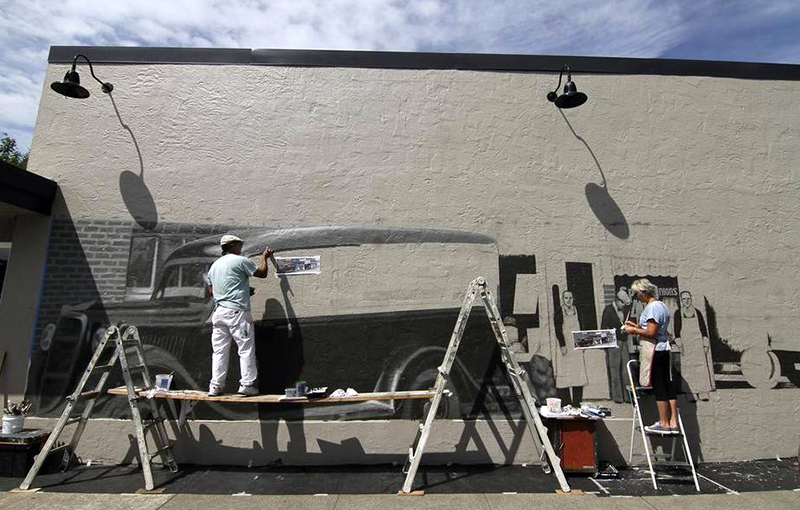 Bob is a long-time sign-painter and mural artist with over 35 years in the business. With him came scaffolding and technical experience that was invaluable. Bob projected my 12-inch x 24-inch line drawing (pictured below) onto 16 sheets of 4-ft x 12-ft paper. An electric pen was used to perforate the lines with tiny holes. Each section of paper was rolled out and taped to the wall. Powdered charcoal was pounced over the design to transfer tiny registration dots onto the textured wall. 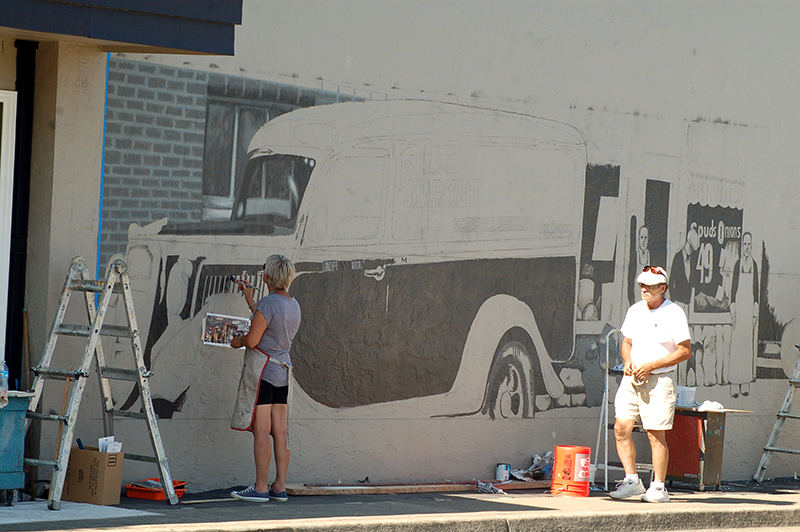 The paper was then removed and the image was refined with graphite before blocking in the darks with latex paint. The weather was a challenge hovering in the high 70's to mid-80's throughout the project that began on August 10, 2015. Direct sunlight heated the wall surface to well over 120 degrees. Paint dried on contact -- gumming up in the brushes like cottage cheese. Just after 3pm each day, the sun crested over the building and gave way to shade and cooler temperatures. 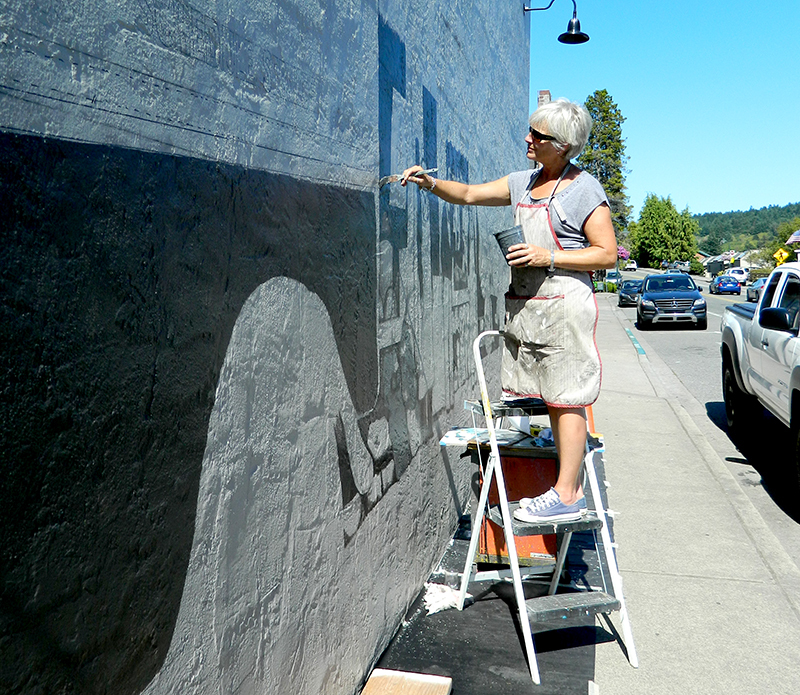 A palette of 5 shades of gray and soft blended lines over the heavy-textured wall ended with 2 layers of satin anti-graffiti finish on September 26. A gathering of friends at the Finholm Marketplace on October 10, 2015 marked its completion. 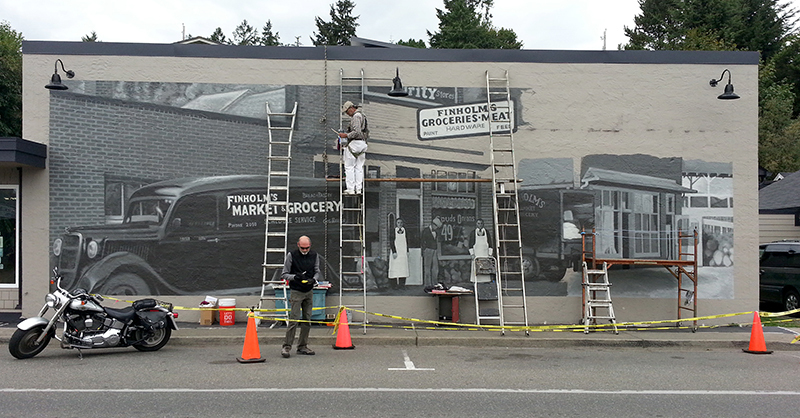 The 14.5-ft x 45-ft mural was completed on September 26, 2015, and is located at 8812 North Harborview Drive in Gig Harbor. If you are interested in purchasing a print of the Finholm Mural or cards, contact me. The head of the bay business district included a post office, livery stable, general store, and real estate office. Around 1907, Swedish Captain Axel Uddenberg built his home and opened a meat market near this site. And although the hillside was sparsely populated with only about a dozen homes until the early 1920s, “Front Street” was a hub for early business development in the community. Axel built the existing store and the adjacent building that became the new the post office in 1929. Young Johnny Finholm, son of Swedish immigrants from Finland, worked for Axel and later bought the store which he renamed Finholm’s Market in 1932. He (far right) and his brother Ed (far left) are pictured here circa 1935. The store was operated by the Finholms until 1979. The building sold and was repurchased by Monte and his wife, Teddi (the daughter of Johnny Finholm), in 2001. 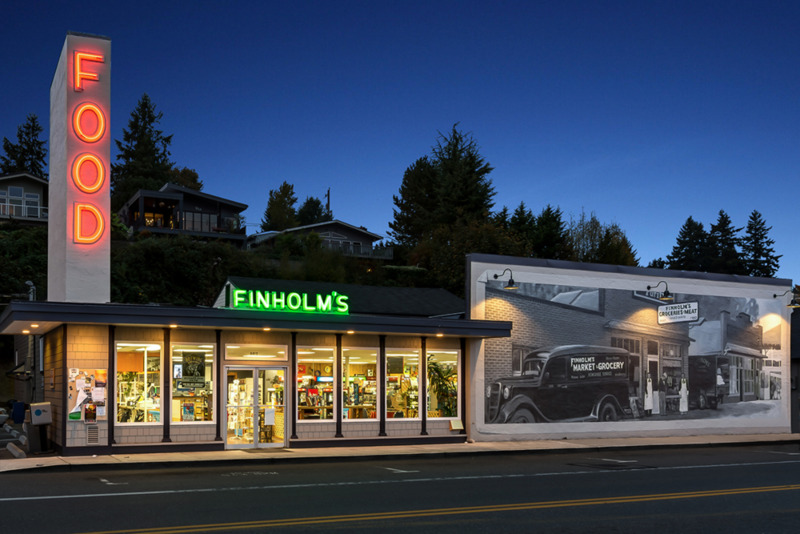 In honor of the contributions to Gig Harbor by the Finholm brothers and their families and for the purpose of preserving the character of the town’s historic Finholm District, the Hesters restored the building and commissioned the mural in 2015.